T-Shirt designs are the cornerstone of any clothing line. It is the foundation upon which it is built. TDG specializes in graphic designs that are really unique. Our graphics are “Hand-Drawn” & computer strengthened in order to bring you a fusion of high-end quality designs. The results are designs that are eye catching visual masterpieces. We retain the highest degree of accuracy for all our projects. Most companies specialize in one style or one looks. TDG can adapt to any pictorial look the client choses. Versatility & Experience gives TDG the advantage to produce the hottest designs that will stun and amaze you. TATE DESIGN GROUP is a world leader in custom t-shirts, screen printed and embroidered apparel. We are a professional custom t-shirt printing company that focuses on taking good care of our customers efficiently while offering high quality custom t-shirts. Our designs are spread over a 20 year periods with each design better than the last. We are current on all Fashion & Style trends to give your business or start-up of the best edge. We can create your t-shirt line from concept to end product. TATE DESIGN GROUP provides fast turnaround on all custom t-shirt orders from art approval. We handle every step of the custom t-shirt printing and embroidery process. Starting a t-shirt line? When starting a t-shirt business, you may have a lot of questions about how things work, what the costs will be, and how will you handle the various aspects of running your own t-shirt operation. Do you have an idea for a new line of hooded sweatshirts? Tank tops? TATE DESIGN GROUP will work with you to create a brand that people want to wear! 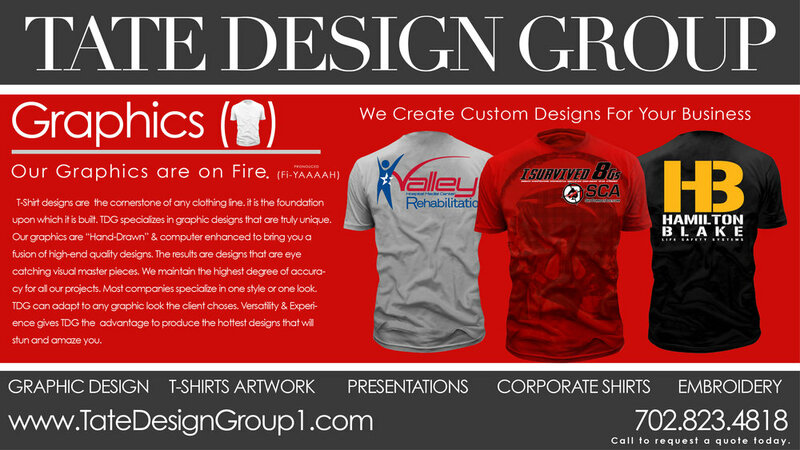 TATE DESIGN GROUP is a world leader in custom t-shirts, screen printed and embroidered apparel. We are a professional custom t-shirt printing company that focuses on taking good care of our customers efficiently while offering high quality custom t-shirts. Our designs are spread over a 20 year periods with each design better than the last. We are current on all Fashion & Style trends to give your business or start-up of the best edge. We can create your t-shirt line from concept to end product. TATE DESIGN GROUP provides fast turnaround on all custom t-shirt orders from art approval. We handle every step of the custom t-shirt printing and embroidery process.